The good the bad and the ugly. That should really be the title of this blog all about the reality of starting Daily 5 in kindergarten, because let’s face it, you have to be able to roll with the punches, duck and weave and basically multitask like a madman these first couple of days right? 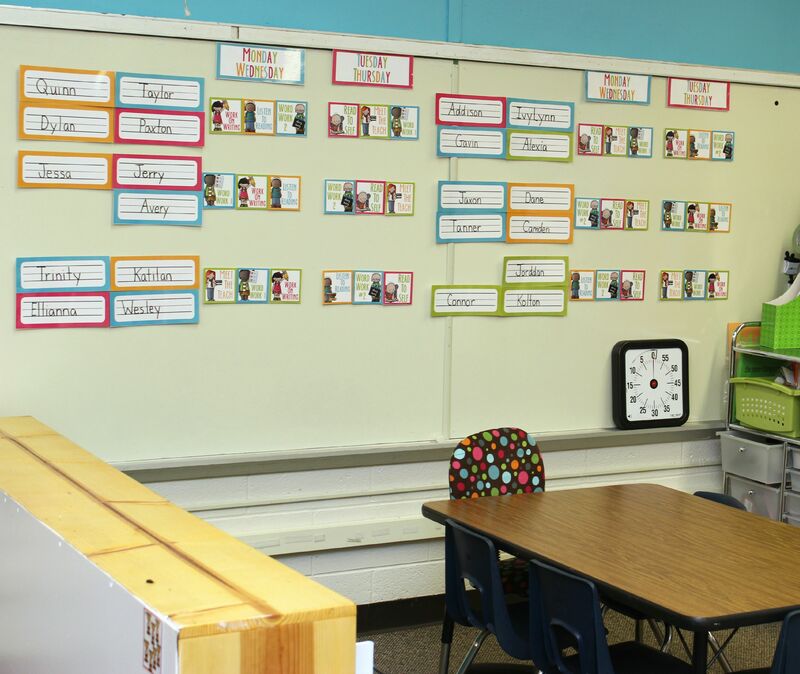 If you caught my last post, it was all about my plan and set up for Daily 5’s first days. If you missed it, you might want to check it out first HERE. In any case, the plan and activities are pretty easy to see if you look at the graph below. And then there is how it all panned out. First all you should know, that if there is any possible way for me to pre-instruct or pre-demonstrate, I take some time to do it. It might be as easy as setting up a came and taking three or four minutes to play it as a whole group before sticking it in a station. These are all know to them, so any help I can give myself is going to be needed. And also remember, there won’t be ‘read to self’ at the ‘read to self’ station because my class hasn’t even begun to build up stamina. Until that happens, I will substitute ‘read to self’ with an activity for the group visiting there. Also, in the first days of Daily 5, I always let students know where they are going. I don’t expect that they can read the station board and understand it yet . . . but they will shortly. I also don’t expect that they will easily and simply be able to remember where they are supposed to go and make it to their first (or next) station without A LOT of prompting. So we point before we go in those first days. It’s a lifesaver . . . trust me. As it is, you know it’s a little bit like organized chaos. You quickly find those students who struggle with two-step directions and are prone to ‘getting lost.’ Those are the little cherubs that you give little hints to until they catch on or buddy them up with a partner to keep them moving forward. It makes your head spin around a bit as a teacher, but you quickly learn just how good you are at multitasking. So you know how I told you I would share with you the good, the bad and the ugly of this first day, well I’m starting right out with the ugly. In my panic to be a teacher and get stations going, I failed to get a picture of the first station in action. I know, I know . . . it’s not anything else was going on at that time. I must have been sipping my tea and eating bonbons and lost track of time (said no kindergarten teacher EVER). I guess it’s just proof of how hard we work to multitask during those first days. I like to keep my camera close at hand for documenting kids anyway (but sometimes my phone’s camera is more convenient), but in the early days, it’s harder than ever to A)get time to grab my camera and B)have enough time to make sure you are taking a good picture that isn’t blurry. and I can assure you that I will be incorporating a TON of fine motor activities into my instruction. Whew! We have some penmanship issues to work on and some muscles to build. I completely forgot that I wanted to show you the books I am using for this set of Listen To Readings (I keep my books in for 2 weeks, and then change them.) All I can say is . 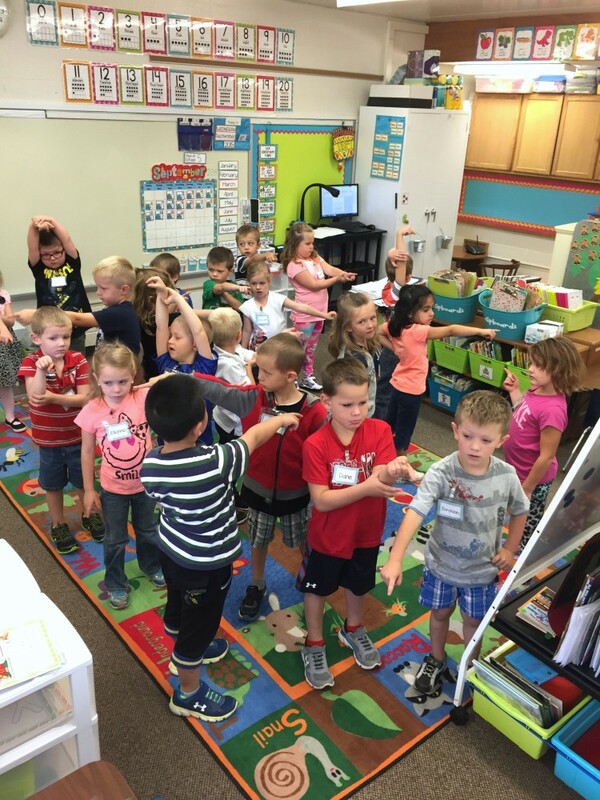 . . first days of kinder. You get it. But good news . . . I was able to get some pictures. 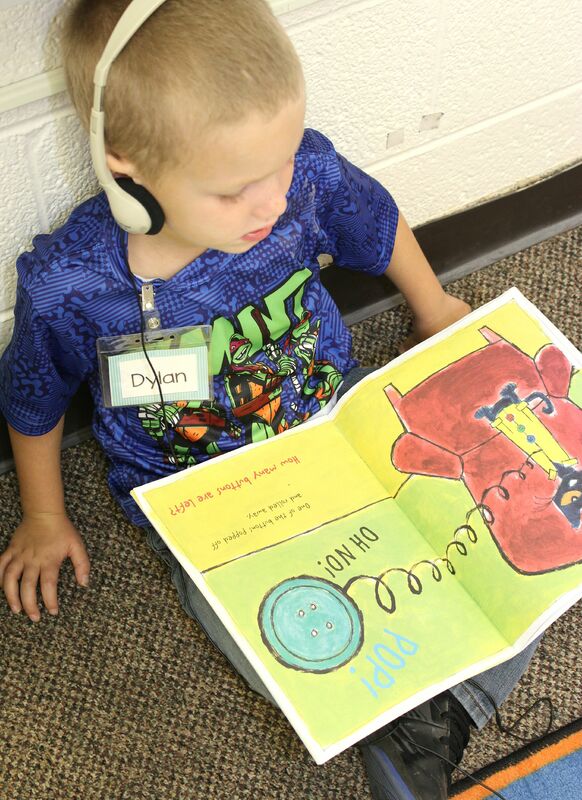 And I know you’re wondering, well why isn’t this sweet little kinder using his CD player to listen to reading? Well that’s another ‘ugly’ of the good, band and ugly . . . 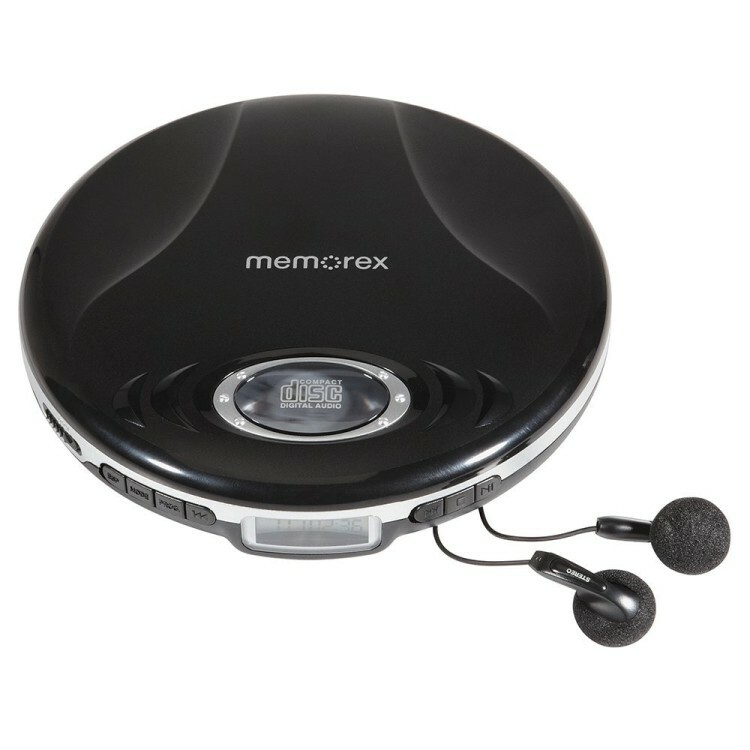 I soon discovered in just how poor of state my cd players were in shortly after we started. I think my kinders last year were really good at taping the battery packs down, holding down a cover and skipping ahead if the cd was skipping. But these poor players were on their last leg. 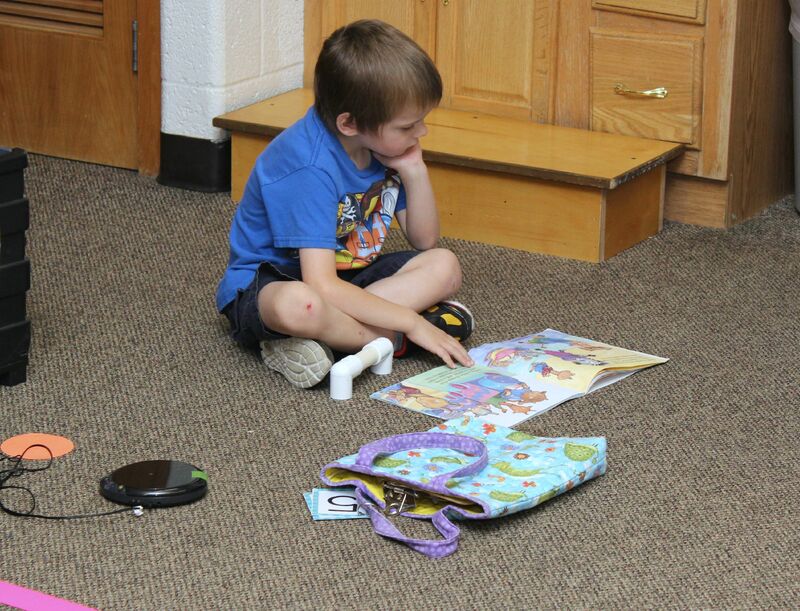 The ‘good’ part of this picture is that he was able to read the story independently so he was still engaged. Luckily, we have a wonderful PTO group at my school and the president heard that my cd’s were quickly approaching a quick trip to the garbage. She suggested that I come to the PTO meeting that night and request some help replacing them. They were so generous to purchase five for me. I had a sixth one that was still working ok. So I ordered these new bad boys to replace my oldies. 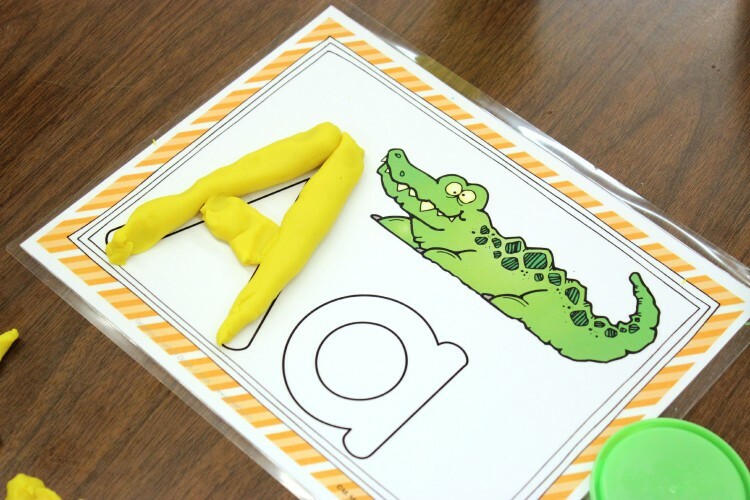 Always a HUGE hit amongst new kinders, even for those students that were familiar with the letters, these play-doh mats from Back To School Word Work Galore are invaluable for building fine motor. 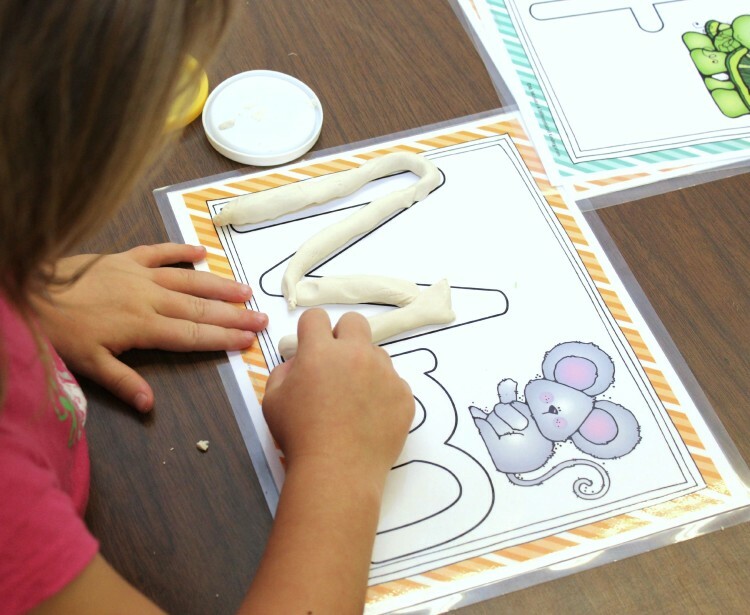 It never ceases to amaze me how difficult it is for some to make a long ‘snake’ of play-doh. They need the practice with their hands so desperately that I even had them cutting up the letters after they made them so that they could get some more exercise and have a bit a resistance while cutting. They LOVED it, and all in all, this station went very well. Now a couple of weeks from now, this really will be a ‘read to self’ station, but since that is a ways off. I put a ‘on the floor’ or at the easel activity out for this station. 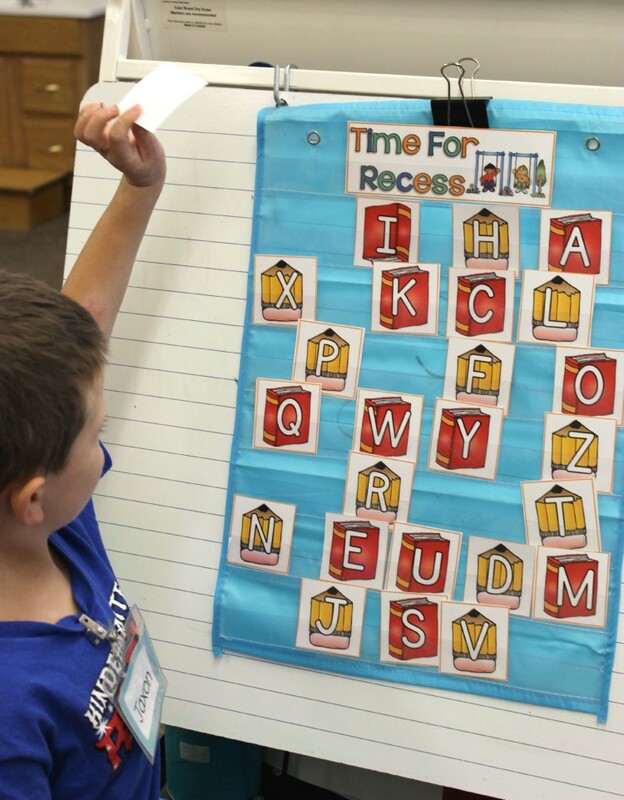 In this case, I used a game called ‘Time for Recess’, again from Back To School Word Work Galore, that we played during whole group first. It only took a few minutes to demonstrate, but that was all it took for my kinders to pick up the rules and routines of playing this game for stations. Basically, one student hides a picture of a clock behind a letter while the other students are turned around and hiding their eyes. 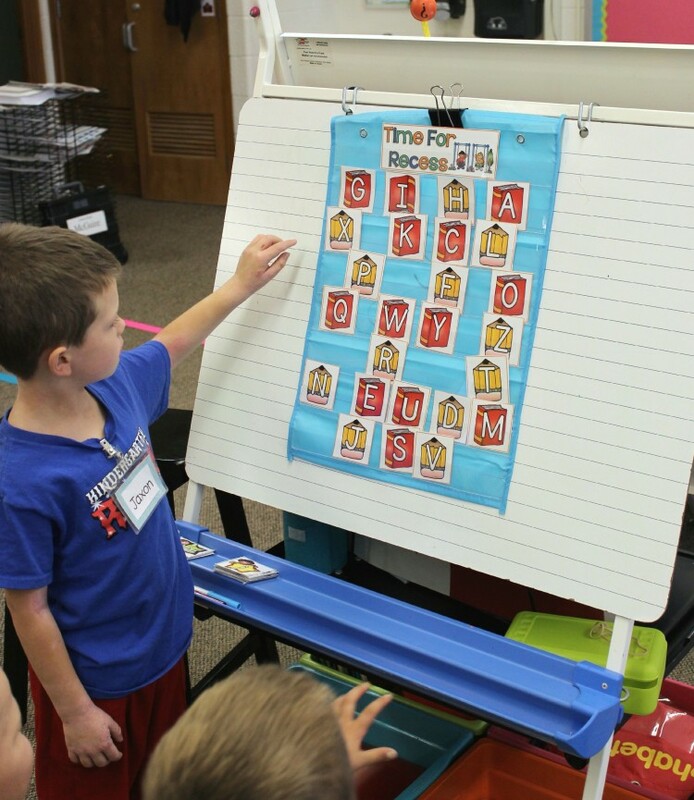 Then one by one, they guess a letter that they believe the clock is hidden behind in the pocket chart. The person who hides the card then locates the letter and removes it to reveal whether or not the clock is there. If the clock is located, then that player gets to hide it next. 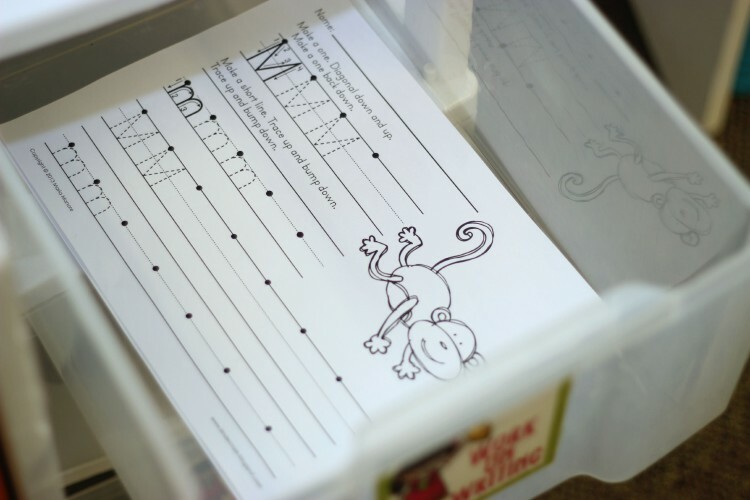 This game is a HUGE HUGE HUGE hit in my kinder class, and I use it throughout the year. I’m so glad that it went so well during the first day of Daily 5, they needed very little, if any, redirecting and it was very independent. 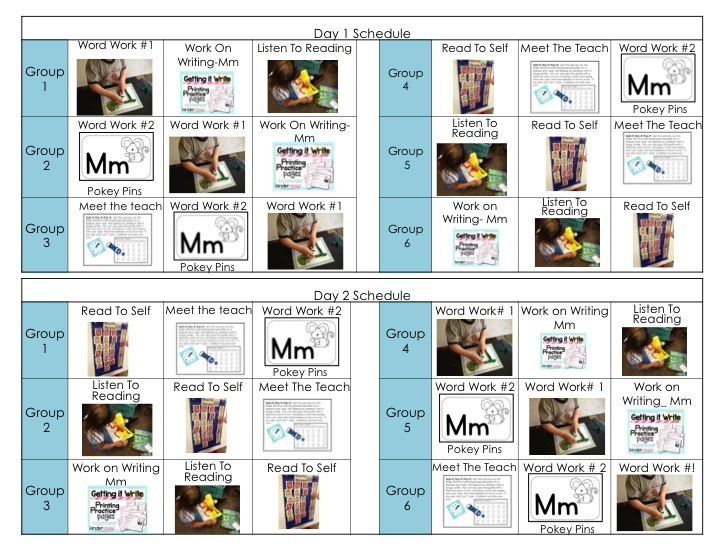 During the first week (and possible two) of Daily 5, I don’t have a guided reading group per se, because I can’t really dedicate myself to those students until I know my other stations have become independent. I don’t want to be interrupted when I’m working with those little ones, and I still need to train and model how the other students should be while I am at guided reading. 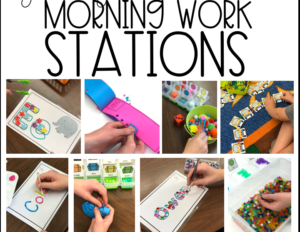 So for this first set of stations, I placed an activity that I knew they would need to become familiar with quickly, one that last year’s kinders begged for and one that they would be using through the year. 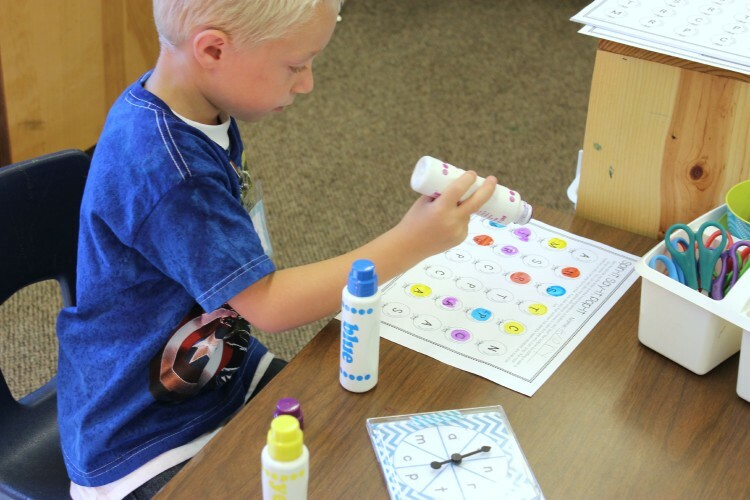 Spin-it, Spot-it, Dot-it from Back To School Spinners Galore. I use spinners a lot so I knew that this was going to be a great ‘get your feet wet’ initial activity. 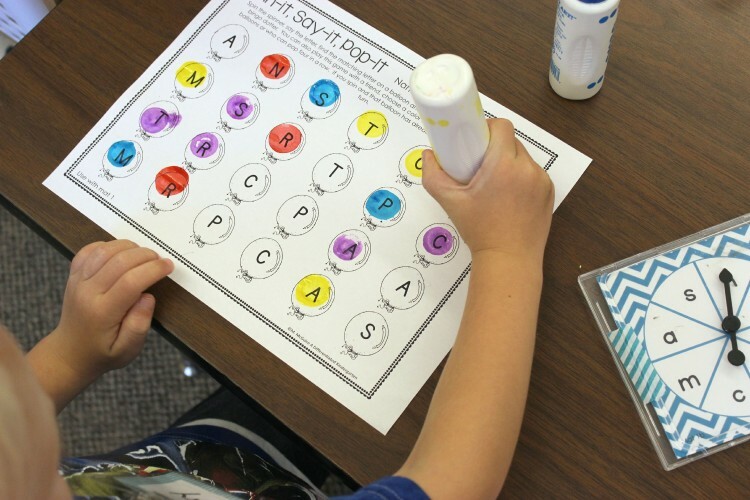 Students simply spun the spinner and had to match the lowercase letter to the capital on their sheet. When they found it, they got to ‘dot’ it. This was a really comfortable activity for many students, but there were a few students that needed the scaffolding of an alphabet mat. I was totally ok with that. In my mind, these first days, without having assessed them to know what they do and do not know yet, I’m happy if they can understand the activity first and foremost. Anything beyond that is a bonus. The good part is that students really love dotters. And anther good part is that they seemed to be very eager to help each other other out when they got ‘stuck’ on a letter. The bad and ugly part of this activity was that even though I pre-modeled it, I didn’t explain or demonstrate the way to spin a spinner. I always forget that there are kids that have never had the experience of spinning a spinner. It just seems so unbelievable to me, but true. So, of course, I had to give some one-on-one lessons to get some of my friends going. Also, I didn’t anticipate that some students wouldn’t be able to match up lowercase and capital for only these 8 letters, but that’s part of pre-assessing before differentiating. You just never know. I should have had the option of just matching letter to letter first, but that would have been too easy for so many of the other kids. In the end, it ended up ok because of their willingness to help each other out. Don’t you love that about kinders? Again, fine motor is like gold to me right now, and they did great with pokey pins. I know a lot of teachers worry that students will get hurt with these, but I have to tell you, when you model and go over expectations and routines for taking care of the pins, you don’t have any issues. And kinders think it’s amazing that you’ll let them ‘play’ with a pin. Another ‘win’ for first Daily 5 stations! And there you have it! The first days of Daily 5 . . . the good, the bad and the ugly. I can tell you that as crazy as the first day(s) seems, it does get better very quickly. When you are able to stop and talk about the things that went well and the things that ‘we’ need to get better at after each set of stations, it really helps. That reflection time and reflecting on the day before’s reflection time before starting a new set of stations will help students remember what they want to change. Another big tip that always helps me is to use sit spots. Kinders don’t understand ‘sit away from each other’ or ‘pick a good place to sit on the floor,’ and it’s especially difficult if you have a little bitty room. 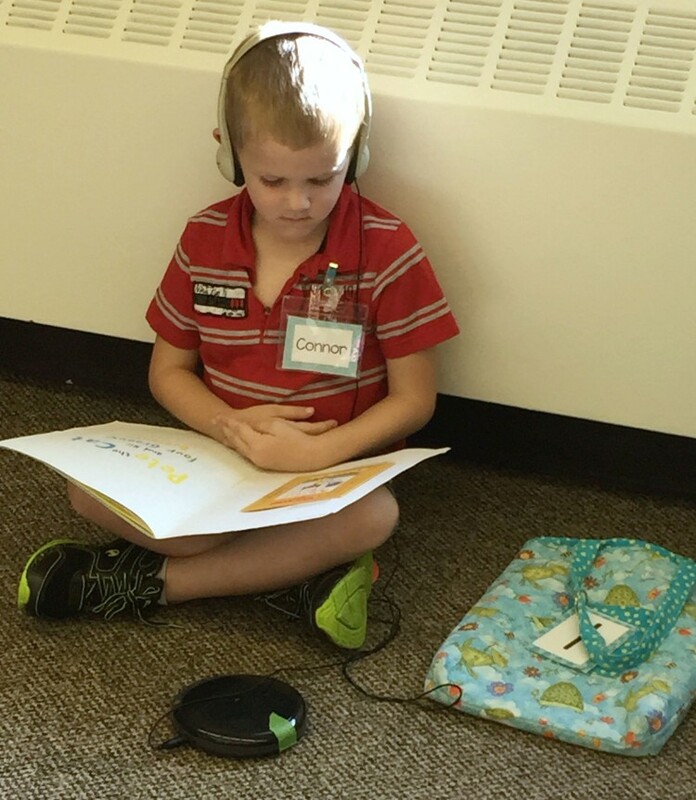 However, with Sit Spots I can tell them to go find an orange spot for ‘listen to reading’ or find a pink spot for ‘read to self.’ That is sweet and simple and gives them choices within reason. Finally, I can’t emphasize enough what a good plan will do to make those first days successful. If you fail to plan (for everything that could happen), you plan to fail. Take the time, plan, organize, model and go slow! I certainly hope a little glimpse into my first day reality helps your first days of Daily 5. As a brief update, I can say that 2 weeks in, today I actually sat down at my guided reading table and did not have to get up to redirect for the entire hour of Daily 5. That’s a big accomplishment in my book. Thank you for this. It makes me feel better about my first weeks beginning Daily 5 in my classroom! Be gentle with yourself. Good habits take time to stick. Hi Marsha, I was just wondering if your kids ever say “again” when they go to a station again another day. I saw there were 6 stations. Also when you say they made it to 1 hour, that included the 3 rotations? Did you ring a bell, they clean up and point and then walk to their next station? Thank you for sharing the real with all of us! No because if you think about it, they only go to any one station twice a week. Within those stations, there are choices (But we haven’t gotten to that part yet. I’ll post about it in the next week or so. ), so they don’t necessarily do the same activities. Although, I will tell you, kinders will play the same game over and over and over if they love it and you let them. But no, they never complain. They love Daily 5. Sorry, still trying to figure out how this all works! 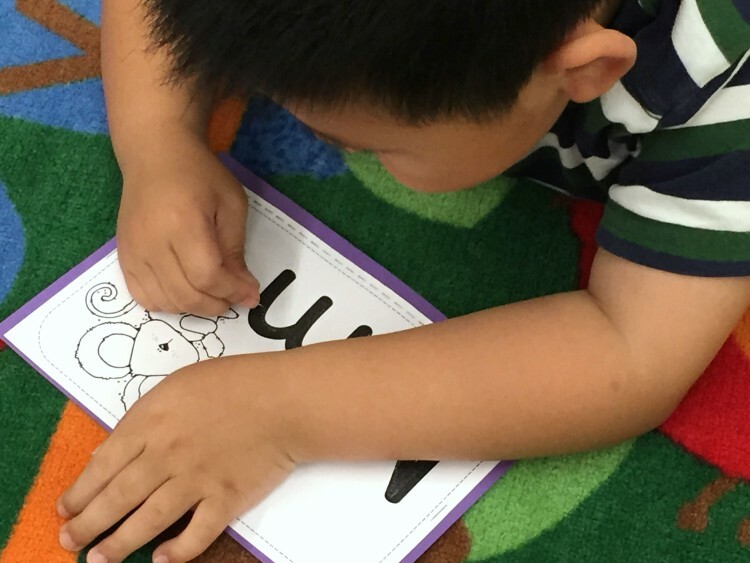 I’m on day 17 of kinder with my kids…and I feel like I’m so far behind!